SANTA CLARA, Calif. and WASHINGTON, D.C., Jan. 20, 2016 – Intel Corporation and the Society for Science & the Public today recognized 40 U.S. high school seniors as finalists in the Intel Science Talent Search (STS), the nation’s oldest and most prestigious pre-college science and math competition. The Intel STS encourages students to tackle challenging scientific questions and create technologies and solutions that will positively impact people’s lives. For a list of this year’s finalists, visit https://student.societyforscience.org/intel-sts. 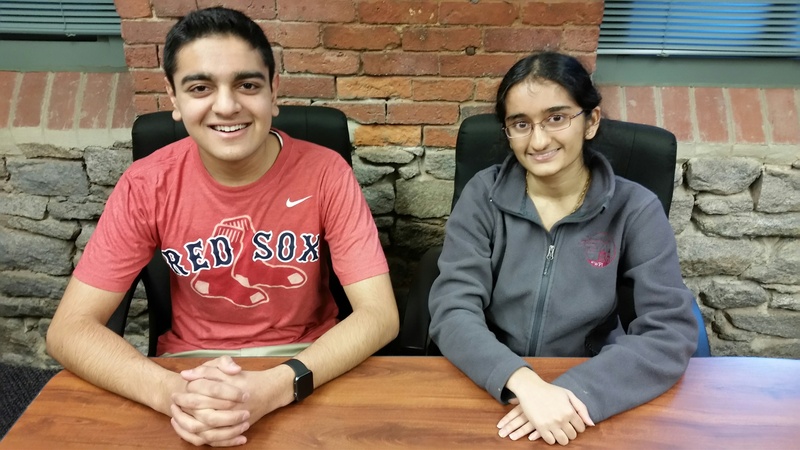 Yashaswini Makaram and Amol Punjabi of Northborough, both seniors at the Mass Academy of Math and Science at WPI in Worcester, have been named finalists. 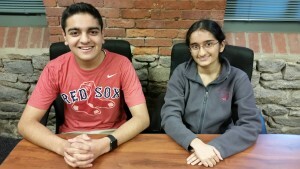 They are the only two students selected as representatives of Massachusetts to continue in the competition. Yashaswini’s project is titled “The Phoney Lift: Using Accelerometers to Identify People”. Amol’s project is titled “ViaPocket: A New High-Accuracy Druggability Predictor and Its Application to Intrinsically Disordered Proteins”. Both will present their research in Washington during the competition. Mass Academy Director Michael Barney comments,” We are extremely proud of Yasha and Amol for the work they have done, and will continue to do. They are outstanding role models and tremendous students, who will make a difference in the world”. Intel STS 2016 finalists are from 38 schools in 18 states. Fifty-two percent of this year’s finalists are male, while 48 percent are female. The 40 finalists were selected from 300 semifinalists and 1,750 entrants based on the originality and creativity of their scientific research, as well as their achievement and leadership both inside and outside the classroom. Finalist projects are distributed among 18 categories, including animal sciences, behavioral and social sciences, biochemistry, bioengineering, cellular and molecular biology, chemistry, computer science, computational biology and bioinformatics, earth and planetary science, engineering, environmental science, genomics, materials science, mathematics, medicine and health, physics, plant science, and space science. Finalists’ research projects include an advanced encryption system with applications in cybersecurity; a low-cost, smartphone-based tool to diagnose respiratory illnesses such as asthma and chronic obstructive pulmonary disease (COPD); and improved concrete seals for undersea oil wells. While in Washington, D.C., Intel STS finalists will undergo a rigorous judging process, interact with leading scientists, display their research to the public at the National Geographic Society and meet with national leaders. Winners will be announced at a black-tie, invitation-only gala awards ceremony at the National Building Museum on March 15, where Dr. Neil deGrasse Tyson, astrophysicist and Frederick P. Rose Director of the Hayden Planetarium, will serve as the keynote speaker. In the past, young innovators chosen to participate in the STS have gone on to receive more than 100 of the world’s most prestigious honors including 12 Nobel Prizes, two Fields Medals, 11 National Medals of Science, 18 MacArthur Foundation Fellowships and even an Academy Award for Best Actress. In celebration of the 75th anniversary, the Society is inviting many former Science Talent Search alumni to attend the gala, as well as an alumni conference that will feature panel discussions and prominent alumni speakers. Society for Science & the Public (SSP), the nonprofit organization dedicated to public engagement in scientific research and education, has owned and administered the Science Talent Search since its inception in 1942. To learn more about Society for Science & the Public, visit www.societyforscience.org, and follow the organization on Facebook and Twitter.